Bleeding Black Noise is a revision of Steven Parrino’s statement “My relation between Rock and visual art: I will bleed for you.” Here the curator replaces Rock with Noise, and celebrates the Bleeding as a release of the Black Noise, raw energy and formless potential. 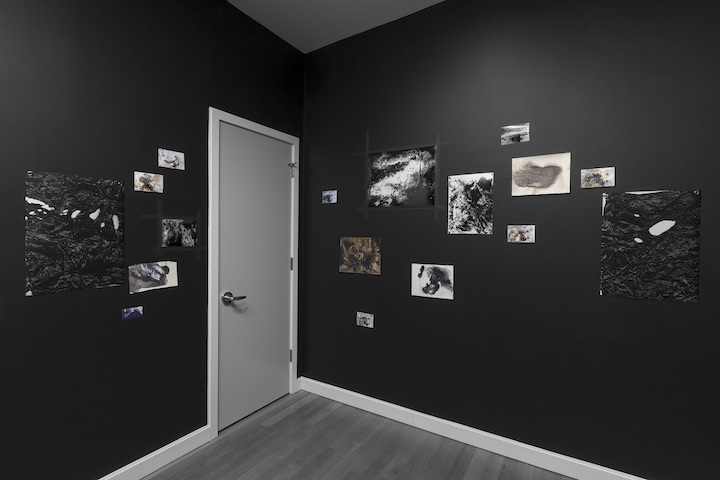 The collected works on paper of seven artists provide encounters with dust, electromagnetism, sympathetic magic, ecology, politics, and a passion for storms. Each of the artists are involved in experimental music—as active musicians or collaborators. This exhibition is coordinated to appear near large bodies of water. In Chicago it will take place during the season when the melted ice and city-street sludge mix in ecstatic swirls of primordial fluids, and when the snow causes audiovisual sensations to move to the forefront and include the perceiver within the elements themselves. Amelia Ishmael is a curator and writer, specializing in visual art’s relations with experimental music. She curates video and film screenings and gallery exhibitions for venues across North America, Europe, and in print—including “.blacK~SSStaTic_darK~fuZZZ_dOOm~glitCH.” (2013) and “Black Thorns in the Black Box” (2012), the journal portfolios for Helvete: a journal of Black Metal Theory (2013-2016), and the internationally recognized exhibitions “Black Thorns in the White Cube” (Western Exhibitions, 2012) and Charlemagne Palestine’s solo installation “divinitusssanimalusssacréusssorganusss” (Experimental Sound Studio, 2014).